Store, protect, and transport your DSLR or mirrorless camera, two lenses, related accessories, and personal gear with the SOLECARRY/26 Duffle Bag in khaki/saddle from Studio 26. Inside the duffle you'll find one zip and six slip-in net pockets. The tote features a foldable padded insert with touch-fastening dividers, one exterior zip pocket, and three slip-in pockets. 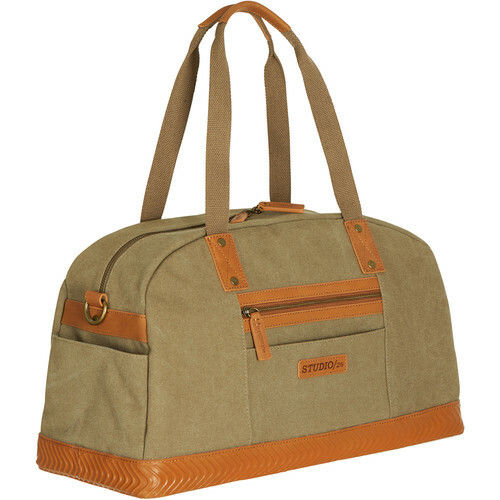 Carry the duffle with the top strap handles or the padded shoulder strap. Users will appreciate the rubber bottom panel and the canvas/leather construction. Box Dimensions (LxWxH) 19.6 x 8.4 x 8.0"